Available in Matching Pink for Boy/Girl Twins! 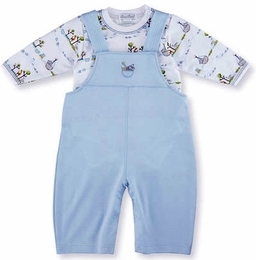 Two by two couldn't be cuter than on this adorable Noah's Ark Overall Set! This precious two-piece outfit includes a long-sleeve playsuit adorned with the SWEETEST all-over print of Noah's Ark animals. Blue trim on the neckline and sleeves finish the look. The overalls have snap shoulder straps and a square neckline with a detailed Noah's Ark applique on the front. With a flat front and relaxed fit, the snaps through the legs make this a comfortable and easy outfit for baby. Each garment features the signature softness and durability of the finest Peruvian Pima cotton so that only the most luxurious and gentlest fabric touches baby's skin. Kissy Kissy's fine layette collection is known for its ultra-comfortable clothes and signature prints, making it the perfect choice for baby's layette or baby shower gift.